On the morning of 24 June 2016, the result of the UK referendum on EU membership was announced. While 51.9% of the electorate (on a 70% turnout) voted to quit, 48.1% voted to stay in, giving the Brexit side a clear win. As the result was announced, prime minister Cameron quit, sterling plunged and the ruling SNP in Scotland, whose residents voted overwhelmingly for remaining in the EU, hinted at independence. The FTSE slumped 8.7% on opening before reducing losses to 4.3% for the day. Bank stocks took a special hammering. The result was ” … a jolt”, said the Financial Times, “with the potential to fracture not just the Union but reshape the postwar order in the west. Brexit tugs at the bonds holding the bloc together, and collective standing clout of the members” (Alex Barker, ‘Geopolitics result puts 70 years of EU integration into reverse’, 25 June 2016). “It is an explosive shock. At stake is the break up, pure and simple, of the Union”, commented Manuel Valls, the French prime minister (see George Parker and Michael Mackenzie, ‘Britain breaks with Europe’, Financial Times, 24 June 2016). In the same article as the above comment by Mr Valls appears, the Financial Times admitted that	“The vote reflected a roar of rage from those who felt alienated from London and left behind by globalisation [i.e., imperialism]”. Again in the same issue of the Financial Times, Philip Stephens wrote that the vote represented a ”	deep disgrumtlement with a political and economic system that is seen [and is!] rigged against the hard-working classes. “For a decade or so badly skewed distribution of the gains of globalisation and widespread tax evasion on the part of big business were camouflaged by buoyant economic growth. Since 2008, the unfairness has been amplified by austerity: the wealthiest one per cent have been barely touched. Like all well-bred mercenary defenders of capitalism, Mr Stephens concludes thus: “Politicians must confront excesses. If they want to save liberal democracy [i.e., the rule of the bourgeoisie],	they will have to reform capitalism” (‘How a cautious nation came to tear down the political temple’). Obviously, Mr Stephens’ vision does not extend beyond capitalism, which to him is eternal rather than being a transitory phase in humanity’s long march from primitive communism to the higher stage of communism, when the dictum will be put into practice: ‘From each according to his ability, to each according to his needs’. The referendum revealed deep divisions across Britain, with Scotland and prosperous London voting by a large margin to stay in, while working-class towns, seaside resorts and rural England backed the Leave side. Labour Party heartlands turned out in large numbers to deliver a staggering blow to the establishment and the status quo, bringing to an end Britain’s 43-year membership of the EU. ” This has been Britain’s most class-based vote of recent decades, with the normal cross-class alliances dissolving into an early 21st century ‘peasants’ revolt'”, wrote Mr David Goodhart of the Financial Times in ‘The outers’ message resonated with those who feel left behind’, 24 June 2016. Thus it is as clear as daylight that the British proletariat has stood up to big business, the multinationals and the billionaires, to vote against continued membership of the European Union, despite all the threats to which it has been subjected and the scorn and derision poured on it for wishing to defy its masters and rebel against the austerity which has so undeservedly been imposed upon it. It has proved itself worthy of being dubbed the “puer robustus sed malitiosus’ (the sturdy but unruly boy’) to use the apt expression of Engels. Of course, the reasoning behind its defiance is immature, led as it is not by a proletarian party committed to forwarding its class interests, but by various bourgeois and petty-bourgeois charlatans with their own axe to grind. 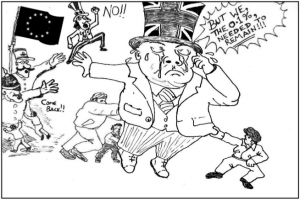 It is still infected with the xenophobia instilled into it by an imperialist bourgeoisie that needed to use its proletarians as pawns in the fight to subdue the colonies, the plunder of which made Britain great. This xenophobia today expresses itself as fear of the foreigner entering the country ‘to take our jobs’, a fear as great as it is irrational. Because of it, the proletariat is for the most part unable to see what is glaringly obvious, namely, that British jobs have mostly been lost as a result of the export of capital by the imperialist British bourgeoisie, hand in hand with technological advance and the gains in productivity; and that if a few industries have managed to hang on, it is precisely because many jobs could be very effectively done by cheap immigrant labour – thus preserving some jobs also for those born British that would otherwise also have been lost to the export of capital. There are those who think that because of this wrongheadedness motivating a large percentage of the Brexit vote and the shambolic bourgeois leadership of much of the movement, we should be appalled and ashamed, not congratulatory. We would repeat, however, that what is admirable – even apart from the anti-imperialist outcome of the vote – is the defiant spirit of the oppressed masses. There is no escaping the fact that the areas where the Brexit vote has been highest are those which have become de-industrialised as a result of the export of capital and where the proletariat is most severely affected by the crisis of capitalism and the austerity measures that have been taken in a vain attempt to overcome it. In England and Wales, at least, it is the poor who have spoken, while those who are still more or less all right tended to go along with Remain. As for the wrongheadedness, it is now very much the challenge facing those who seek to lead the proletariat to revolution to assist it in overcoming its bourgeois prejudices, and it should not be thought that they will prove unable to do so. As Mao Zedong rightly said, ”	the revolutionary war is a war of the masses; only those mobilizing the masses and relying on them can wage it. (‘Be Concerned with the Well-Being of the Masses, Pay Attention to Methods of Work’, January 27, 1934, Selected Works, Vol. I. p. 147). It follows from this that any person who imagines that wrong ideas among the masses are incapable of extirpation is really giving up all hope of revolution and inevitably sooner or later falls into social-democracy (a search for the chimera of a kinder capitalism), class collaboration, or worse. It is necessary to have faith in the masses, i.e., the confidence that, under the leadership and guidance of a truly revolutionary party of the proletariat, in conjunction with the lessons dealt by experience, the proletariat will be able to reject xenophobia – which is irrational – and replace it with capitalophobia, which is entirely rational. We must work to ensure that whatever misguided ideas may have been harboured in the past by the proletariat of this community or that – and even acted upon sometimes – all are ready to come forward to fight shoulder to shoulder for their interests as proletarians against the capitalist system that is responsible for their misery. 1. Brexit sets the stage for the disintegration of the imperialist bloc that is the European Union. 2. It sets in motion also the disintegration of the neo-Nazi imperialist NATO alliance. Although not every member of the EU is a member of NATO, by and large the membership of these two organisations is largely coextensive. The process of loosening the ties between different parts of NATO, which has been under way since the Gulf War in 2003, is likely to be much accelerated. 3. Consequent upon this referendum the pressure exerted by NATO and the EU on countries such as the People’s Republic of China and the Russian Federation will become far more incoherent as is likely to be revealed in the coming few weeks when the EU is due to discuss the question of extending for another year sanctions against Russia, with several countries in the EU, including Germany, Greece and Hungary, being already unhappy with NATO’s increasing hostility to Russia. Now that Britain is leaving the EU, this pressure is likely to ease considerably, this for the reason that Britain basically is a Trojan horse in the EU on behalf of US imperialism which effectually is the moving force behind NATO. It is not for nothing that even the US President, Mr Obama, going against normal conventions, intervened in the referendum debate imploring the British people not to leave. There are several reasons which impelled the majority of British people to vote for an exit from the EU and undoubtedly hostility to immigration was a major factor. Behind that, however, is the pain which has been inflicted on working people since the beginning of the latest and worst crisis of imperialism in 2007 to the present. With the communist movement weak and opportunism rampant in the working-class movement, with hardly anyone (though there are one or two honourable exceptions) explaining to the working class the cause of its misery, it is not surprising that the working people are inclined to blame their misfortunes on workers of foreign origin. However, the results of the Brexit referendum will shortly demonstrate that in or out of the EU, their misery is solely attributable to the workings of capitalism, and not the Brussels bureaucracy. The ruling class of all the imperialist countries are united in their desire and their efforts to pass the burden of the crisis on to the shoulders of the working class. Besides, as long as the labour market can bear it, there is not likely to be a significant fall in the number of migrants coming to Britain. The only difference would be the country of origin of these migrants. Instead of Poles and east Europeans, it will be people from the Indian subcontinent and from Africa. If, consequent upon the referendum result, NATO’s ability to wage wars against oppressed peoples is weakened, as we expect, then the number of refugees who have been forced to leave their countries by imperialist wars might slow down, which would be good because these unfortunate victims of imperialist wars are not voluntarily trying to enter Europe. On the contrary, they have been forced at gunpoint and by the threat of starvation to leave the countries they love and where they wanted to stay. Racism is the Achilles heel of the working class in the centres of imperialism. Unless it is checked with proper education of the working class in the spirit of internationalism rather than narrow nationalism, it will continue to divide, weaken and render impotent the struggle of the working class for its own emancipation through the overthrow of capitalism in a proletarian revolution. Let the communists take up the noble task of inculcating the working class with the spirit of internationalism and concentrate its attention on the exploiting classes rather than fellow workers of foreign origin who are even more of a victim of the system. That section of the bourgeoisie which mobilised for Brexit may be very happy in the aftermath of the referendum but the smile will be wiped off their faces when they realise the grievous harm that has been inflicted on imperialism in general and British imperialism in particular. Their intentions notwithstanding, it was very easy during the referendum campaign to glibly talk about Britain’s independence from the EU prison house, regaining its sovereignty, and going into the wider world in search of trade and investments; now that their wish has been fulfilled it can be expected they will discover the wisdom of the old adage: ‘Be careful what you wish for’! The referendum results also have serious implications for the political establishment. Both major parties are in disarray and split down the middle, with each half in each of them blaming the other half. David Cameron is being shunted out of no. 10, most likely to be replaced by that buffoon, Boris Johnson. He will find it no easier to control the viscerally divided Conservative Party, the majority of whose parliamentary representatives were in favour of remaining, than did David Cameron. Nor will his administration have any magic formula for curing the deep economic crisis of imperialism which is consequent upon the world crisis of overproduction. His government outside the EU will no more be able to conjure up non-existent demand for the massive overproduction than is the government of independent and almighty US imperialism. Instead of looking forward to being prime minister, he must be terrified of taking up that risky job rather than shouting from the sidelines making flippant comments of a type more commonly associated with 6-year old boys at posh schools. Labour is in no happier position. The right wing of the party is blaming Corbyn for not conducting the campaign properly, but then nothing has changed, they never wanted Corbyn in the first place. The outrage at the murder of Labour MP Jo Cox was shamelessly and cynically sought to be exploited by the Remain camp, but this didn’t work. The Tory Party is divided. There have been deep divisions in the Conservative Party over the question of membership of the EU for more than 2 decades and prime minister Cameron took the decision to hold the referendum as a means of overcoming these differences. As a matter of fact, the divisions in the party are even deeper today after the Brexit vote than they were before and it would not be unreasonable to believe that these divisions could split the Tory Party and render it incapable of forming a government for some time. Not since the repeal of the Corn Laws in the first half of the 19th century, which devastated the Conservative Party, has there been such a deep rift in its ranks. Finally, Britain may be the first country, but it will by no means be the last to bail out. In fact Brexit has prepared the ground for other countries to follow suit. The fantasy of a United States of Europe is disappearing by the day, and the process of the disintegration of the EU is well and truly under way. In the aftermath of Brexit, and the havoc it is bound to wreak in the imperialist camp, Marxist-Leninists have an opportunity to build a serious communist party, representing the real interests of the working class and capable of leading the latter in the revolutionary overthrow of imperialism. Only under socialism can workers be freed from unemployment, hunger, want, homelessness and destitution; only under socialism can they secure freedom from war. Let Marxist-Leninists rise to the challenge. FORWARD TO PROLETARIAN REVOLUTION !